Today, ABIM announced substantial changes to its Maintenance of Certification (MOC) program and indicated a desire to work more closely with the internal medicine community. I reached out to our diplomates via e-mail to open a conversation about how we can work together to improve MOC. 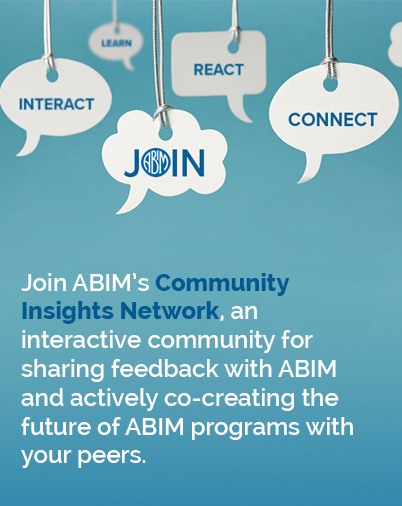 Please join our Google+ Community, Transforming ABIM, to add your questions and commentary to the dialogue, and subscribe for blog updates. We welcome your input and ideas about MOC, its challenges and possible solutions. ABIM clearly got it wrong. We launched programs that weren’t ready and we didn’t deliver an MOC program that physicians found meaningful. We want to change that. Nearly 80 years ago, the American Medical Association and the American College of Physicians founded the American Board of Internal Medicine (ABIM). ABIM was charged with distinguishing the discipline of internal medicine from other forms of practice by creating uniform standards for internists. Those standards have evolved over the years, reflecting the dynamic nature of internal medicine and its more than 20 subspecialties. A year ago, ABIM changed its once-every-10-years Maintenance of Certification (MOC) program to a more continuous one. This change generated legitimate criticism among internists and medical specialty societies. Some believe ABIM has turned a deaf ear to practicing physicians and has not adequately developed a relevant, meaningful program for them as they strive to keep up to date in their fields. ABIM is listening and wants to be responsive to your concerns. While ABIM’s Board believes that a more-continuous certification helps all of us keep up with the rapidly changing nature of modern medical practice, it is clear that parts of the new program are not meeting the needs of physicians like yourself. We got it wrong and sincerely apologize. We are sorry. Effective immediately, ABIM is suspending the Practice Assessment, Patient Voice and Patient Safety requirements for at least two years. This means that no internist will have his or her certification status changed for not having completed activities in these areas for at least the next two years. Diplomates who are currently not certified but who have satisfied all requirements for Maintenance of Certification except for the Practice Assessment requirement will be issued a new certificate this year. Please visit our FAQ page for more information about these changes. I do want you to know that, since the changes being made are significant, it will take time until your individual status page is updated on the ABIM website. ABIM is changing the way it does its work so that it is guided by, and integrated fully with, the medical community that created it. However, I know that actions will speak louder than words. Therefore, ABIM will work with medical societies and directly with diplomates to seek input regarding the MOC program through meetings, webinars, forums, online communications channels, surveys and more. The goal is to co-create an MOC program that reflects the medical community’s shared values about the practice of medicine today and provides a professionally created and publicly recognizable framework for keeping up in our discipline. As the first non-academic physician to lead ABIM, I am particularly proud of my 30 years in private, community practice, and I see this letter to you as a start – a new beginning. The ABIM Board of Directors, staff and I are fully committed to doing a better job – to ensure that ABIM and MOC evolve to better reflect the changing nature of medical practice. It remains important for physicians to have publicly recognizable ways – designed by internists — to demonstrate their knowledge of medicine and its practice. Internists are justifiably proud of their knowledge and skills. However, the current MOC program can and should be improved. Over the next few months, you’ll see communication from me and ABIM leadership, asking about your vision for internal medicine, the MOC program and your opinions about what it means to be a doctor today. We have also created “Transforming ABIM”, a Google+ Community that you can join, to ask questions and share ideas, and blog. I have heard you – and ABIM’s Board has heard you. We will continue to listen to your concerns and evolve our program to ensure it embodies our shared values as internists. Thank you for your input and feedback – and for the important clinical work you do each and every day.